As with any pet, birds require nutritious foods, lots of attention and care, and a place they can call home to feel comfortable and secure. Dogs have kennels, cats have kitty homes, and birds have Bird Cages that make them feel welcome and safe after a long day of squeaking and cooing. It may be difficult to choose the right bird cage for your pet bird, especially if you’re a new pet-owner and have no clue what you’re doing. Don’t worry, it’s not as intimidating as it sounds to raise a happy bird buddy. Today, we’re going to focus on the best hanging bird cages that your pet can take solace in. Hanging Bird Cages is the most natural form of habitat you can offer to your feathery friends. 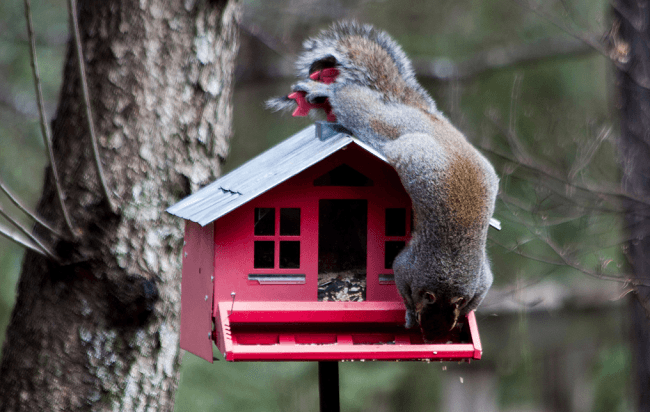 It gives them peace of mind by being high off the ground, making them safe from predators. The bird cages we are going to show you will fit in any backyard, offering not just a great place for your bird to rest, but a good-looking piece to your backyard décor. For those of you who are new raising birds, more times than not, it’s best to begin with something traditional. This Prevue Pet bird cage is a simple small-sized cage that is best for new bird owners raising small species of birds. The top handle makes it easy to hang on a hook or a dedicated stand for the cage. It’s easy to keep clean and perform simple maintenance tasks, helping bird owners become more confident in caring for their pets. For people who raise large-sized birds or already have a large Bird Cage, this house-style bird cage will work perfectly as a temporary cage to place your pet in while you clean out their main home. This bird cage features plastic perches and a feeding cup. You can always throw in a small branch in the cage to offer a more realistic feel for your pets. If you’re looking for something just a little bit different from tradition, then the Prevue Hendryx Triple-Roof Bird cage could be the solution for you. Although traditional one- and even two-roof cages are pretty great, having three roofs which offer shade and protection from harsh weather conditions is something worth considering. However, it works pretty much the same as other rectangular-shaped cages, except that there’s a little bit more space for your pets to stretch their wings, play, and find shade. 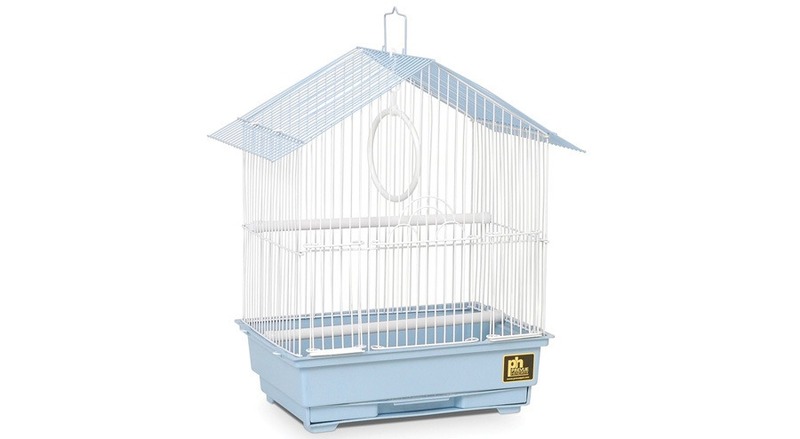 This bird cage comes in two schemes: blue-white and teal-white. Now moving on to the larger-sized Bird Cages to house multiple small-, medium-, and even large-sized bird breeds. As the name suggests, the Flight Cage by Prevue Hendryx is designed to let your pets spread their wings and take flight without ruffling their feathers. 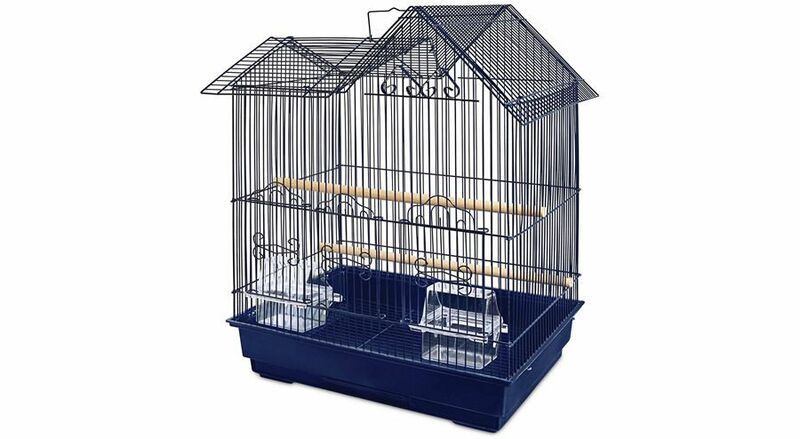 The interior of this bird cage houses four perches of differing heights, two food trays for your friends to munch food from, and two front-facing doors which offer easy access to your pets when it’s time to clean the cage. You need to invest in a proper bird cage stand since this unit weighs roughly 16 pounds after assembly. Bird cages aren’t all just rectangles. As you can see, this Jumbo Scrollwork bird cage is designed to add more class and rustic elegance to your backyard or patio. This cage is large enough to house multiple bird species, though you might only be able to fit one large-sized breed like a gray parrot in the cage without it feeling cramped. 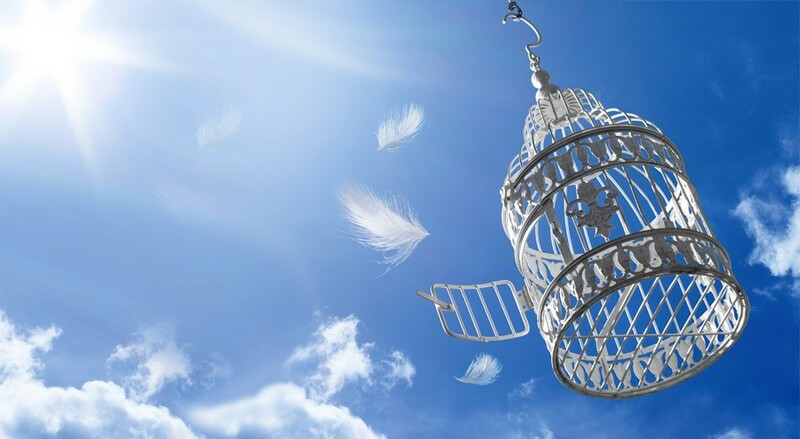 This elaborately designed bird cage comes in either pure black or pure white to match the color scheme of your bird’s feathers and backyard as you see fit. 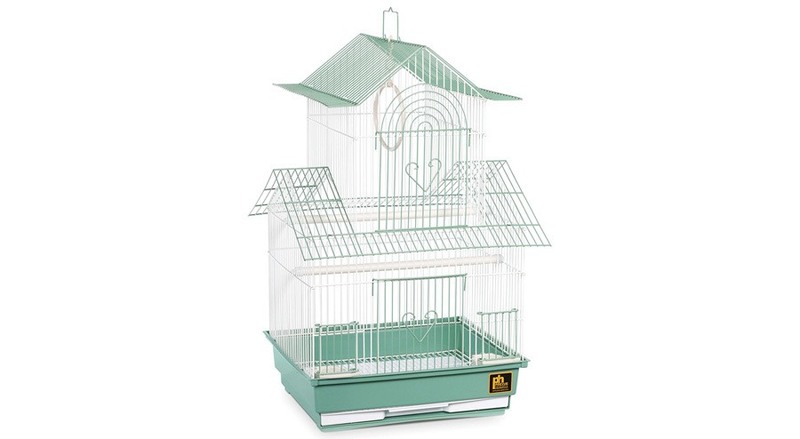 There are single- and triple-roof style Bird Cages for your feathery friends. Now, we’re going to take a look at a great dual-roof style cage. 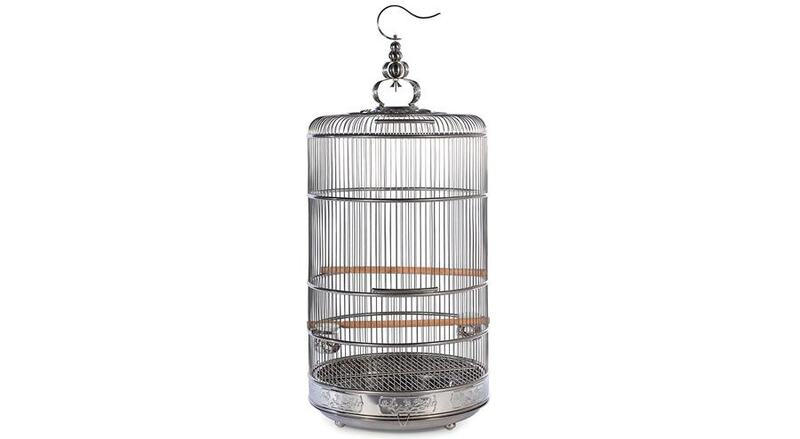 The Ranch House Bird cagecan be an attractive piece to place in your backyard. In addition, it’s a great housing system for your pet birds. There’s enough space for them to fly and perch, though there’s a limit to how many pets you can fit in the cage. In our opinion, one gray parrot is enough since they need space to flap and stretch their wings. 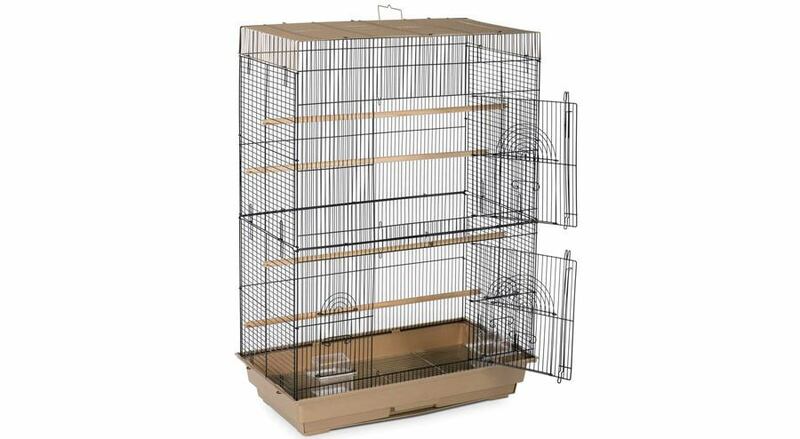 This cage comes with two perches of differing heights as well as two plastic feeders. Although rectangular-shaped Bird Cages are the most bird-friendly and owner-accessible habitats, there’s nothing wrong with cylindrical cages. This Prevue Pet Products’ cage might be a bit cramped in terms of width, but it’s enormously tall, allowing for multiple small breeds to take flight with little to no issues. To clean the cage, just snap off the base and remove the circular grill. You may need a temporary housing for your pets since the detached base gives them open access to the world. 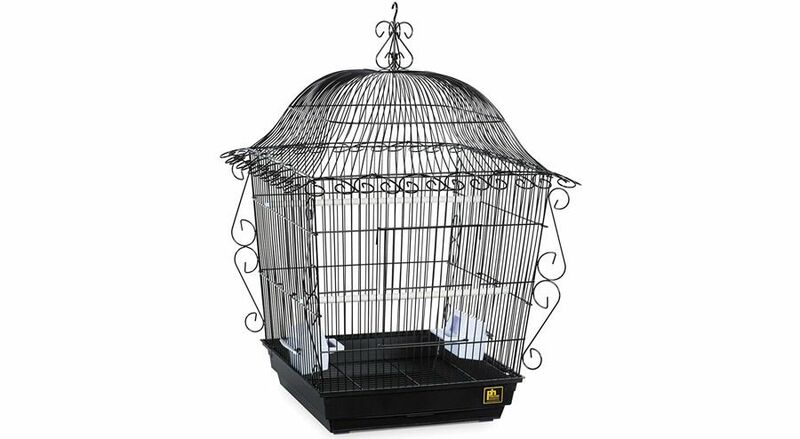 The name is just a suggestion for which bird species you can keep in this cage, but we suggest placing parakeets, canaries, small parrots, and finches in this steel cage. 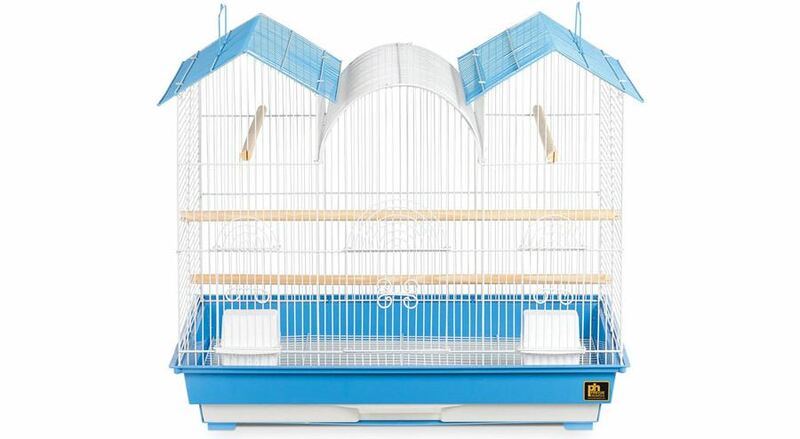 It’s rather tall (22 inches), giving your pet birds a great space to practice flying and perching on the plastic rods provided in the cage. The color-coordinated tray makes it easy to distinguish front from back when wanting to slide the tray back into place.